Through the years, we have learned how to leverage state of the art visualization techniques and technologies. This has allowed us to develop our own tools that can help you deliver cost-efficient solutions using specialized components not available on the market. Contact us to learn how you can access these tools and services for your next project. In applications such as games and augmented reality, being able to provide an immersive experience is a key factor in determining an application’s success. Mobile devices are all about bigger experiences in smaller devices. The Vortex 3D Engine is a custom 3D Engine built on the principles that Algorithmia was founded on: native cross-platform realtime 3D graphics. At its most basic level, Vortex can be seen as a set of proven, reusable components that enable delivering 3D applications and games at dramatically reduced costs. Learn more about the Vortex Engine. 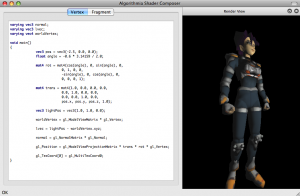 Algorithmia Shader Composer is a custom GLSL Shader Builder application that enables fast shader prototyping and testing. The development environment provides syntax highlighting for Vertex and Fragment Shaders and enables the user to develop and test shaders on any of the preconfigured scenes or even loading user models in any of the currently supported 3D asset formats. 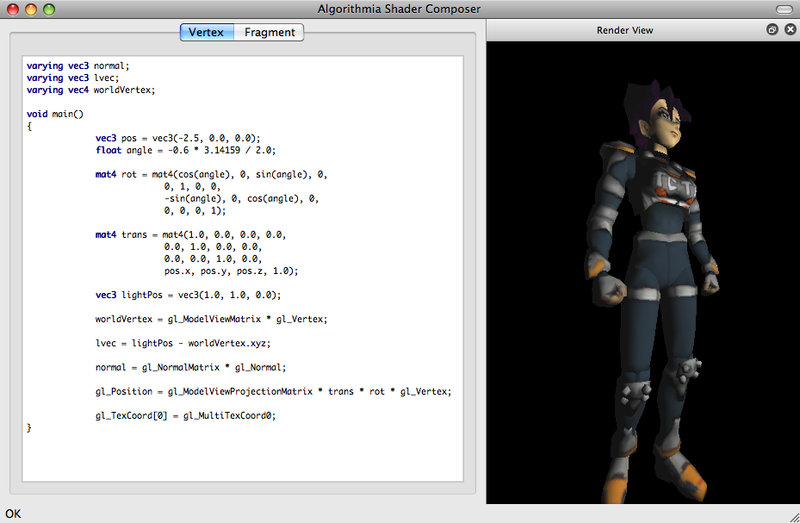 Learn more about Shader Composer.